Technical director Mike Gascoyne commented: "We also have a significantly different rear end lay out. The gearbox is fundamentally the same, but it has reduced weight and it's stiffer. However, we've gone away from the rotary rear damper concept that we've had for the last couple of years to a linear rear damper. We've identified a damping problem with the car over the last couple of years, which we've now put right. When we ran the TF105B all the drivers' comments were that we'd made the front end much, much better, but the car was rear limited ? they were just waiting for the rear to settle down. We had the linear rear damper layout coming along, and in testing we saw that the TF106 was a significant improvement. It matches the rear with the front, and produces a more balanced car." 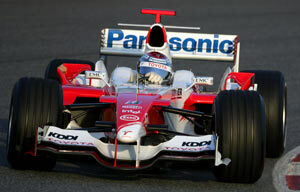 The car was last run in a GP at Catalunya for the 2006 Spanish Grand Prix, held on 14 May. As of Monaco of that year, Toyota ran the Toyota TF106B which had already been tested during tests at Paul Ricard before the Spanish GP.